The 32 Observations series continues with Nathan Jahnke, PFF’s Director of Analytics, finding an interesting piece of information about all 32 teams after seven weeks of football. If you would like to make some observations of your own, you can do so with PFF Elite, where you can find several signature statistics for every offensive and defensive position in football, thanks to Premium Stats 2.0. Buffalo Bills: Cornerback Tre’Davious White has been thrown at on just 7.9% of his coverage snaps, which is the second-lowest rate among cornerbacks. Miami Dolphins: Since the start of the 2014 season, Reshad Jones has 105 stops in the run game. That is 16 more than any other safety. New England Patriots: Over the last three games, offensive guard Shaq Mason has pass blocked 120 times and has only allowed one pressure. His 0.83% pressure rate is the lowest for guards in that span. New York Jets: Cornerback Trumaine Johnson has allowed 12 catches on the season, but on five of them, he was able to tackle the receiver and record a stop. That 41.7% stop rate on catches is the second-best rate for cornerbacks this season. Teammate Darryl Roberts has made a stop on 9 of his 23 catches allowed which is the third-best rate. Baltimore Ravens: Week 7 against the Saints, safety Tony Jefferson produced one hit and one hurry. 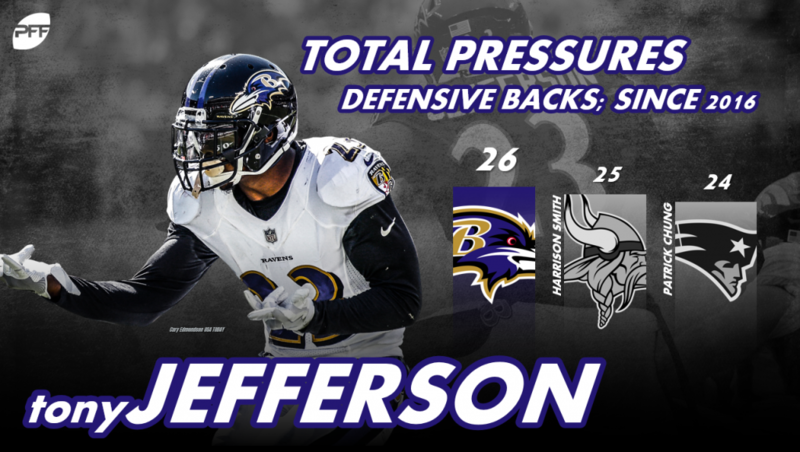 Since 2016, he has accumulated 26 total pressures, which are the most for any defensive back in that span. Cincinnati Bengals: Linebacker Nick Vigil has a run stop percentage of 15.0% which is the best rate among linebackers this season. 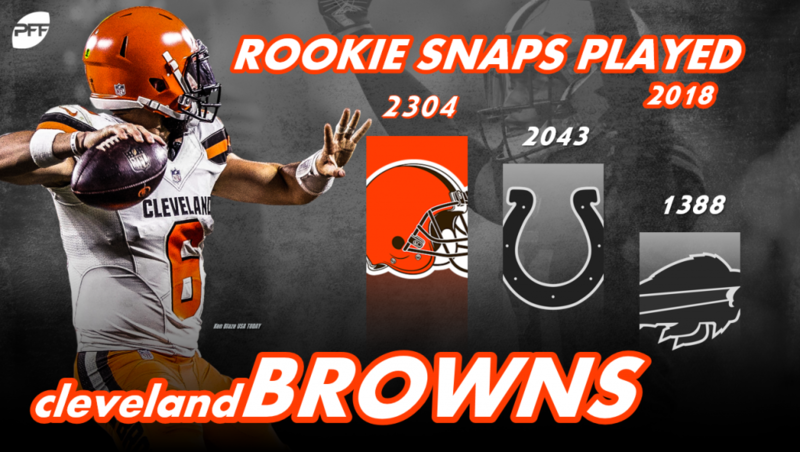 Cleveland Browns: Browns rookies have played a combined 2304 offensive and defensive snaps so far this season. Only one other team has played more than 1400. Pittsburgh Steelers: Left tackle Alejandro Villanueva has allowed pressure on just 1.8% of his pass blocks. That is the lowest rate for left tackles this season. Houston Texans: After being drafted by the Texans in 2016, interior defensive lineman D.J. Reader has made 49 tackles, and 24 assisted tackles in the run game, and he has yet to miss a tackle. He is the only interior defender since 2016 with 500 or more run defense snaps and no missed tackles. Indianapolis Colts: Running back Marlon Mack has had five or more yards on 53.7% of his carries this season, which is the second-best rate for backs this season. Jacksonville Jaguars: Calais Campbell has 23 run stops this season, which is four more than any other edge defender. Tennessee Titans: Right tackle Jack Conklin is one of two tackles this season with 100 or more pass blocks, and no sacks or hits allowed. Denver Broncos: Since 2015, Chris Harris Jr. has made 45 stops after allowing catches. That is five more than any other cornerback. Kansas City Chiefs: The Chiefs are the only team this season to not play a single rookie on offense. Los Angeles Chargers: Denzel Perryman has been thrown at 22 times this season. He has intercepted one of those passes, another six fell incomplete, and on five he’s been able to tackle the receiver for a stop. Having a stop or incompletion on 54.5% of targets is tied for the best rate for linebackers this season. Oakland Raiders: Derek Carr has an adjusted completion percentage of 82.1% this season, which is the second-best mark among quarterbacks. 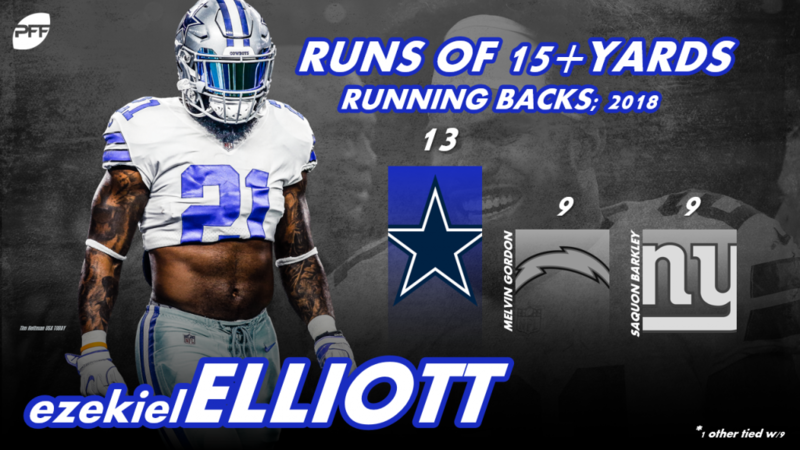 Dallas Cowboys: Running back Ezekiel Elliott has 13 carries of 15 or more yards. That is four more carries than any other back this season. New York Giants: Rhett Ellison has stayed in to pass block 200 times since the start of the 2015 season. He’s allowed pressure on 3.5% of those pass blocks, which is the second-lowest rate for tight ends over that time. Philadelphia Eagles: Safety Malcolm Jenkins has nine stops in coverage, which is tied for the most for safeties this season. Washington Redskins: Jordan Reed has yet to drop a pass this season. In his career, he has a drop rate of 3.77% which is the lowest for all tight ends with 400 or more targets since 2006. 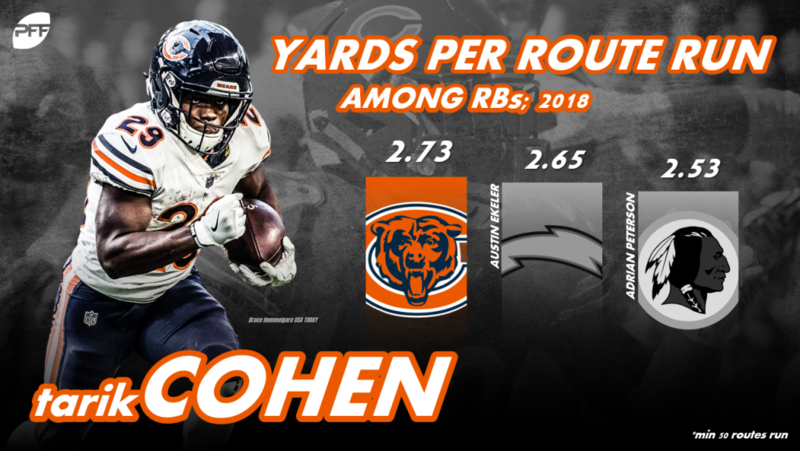 Chicago Bears: Tarik Cohen is averaging 2.73 yards per route run, which is the best rate for all running backs this season. Detroit Lions: While Kenny Golladay typically lines up out wide, when he’s in the slot he’s caught seven passes for 173 yards. His 23.3 yards per catch from the slot are the most in the league. Green Bay Packers: The only defensive player with more than 25 sacks since 2013 with no missed tackles on the quarterback is Nick Perry. He has 38 sacks in that time. Minnesota Vikings: Stefon Diggs has 48 catches this season and has yet to drop a pass. He has the most catches for a wide receiver this season with no drops. Atlanta Falcons: Since 2015, cornerback Desmond Trufant has made 97.5% of the tackles in coverage that he has attempted, which is the best rate for cornerbacks in that time. Carolina Panthers: Efe Obada has seen his playing time increase each of the last three games and for good reason. He has pressured opposing quarterbacks on 20.0% of his pass rushes which is third-best for edge defenders this year. 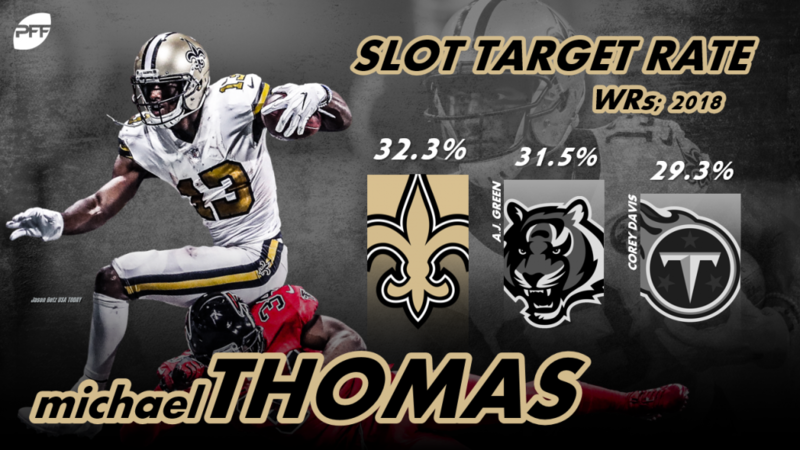 New Orleans Saints: When Michael Thomas lines up in the slot, he is targeted on 32.3% of his targets. That is the top rate among wide receivers while in the slot. Tampa Bay Buccaneers: Demar Dotson has allowed pressure on 4.9% of his pass blocks since 2013. That is the best rate for all right tackles with at least 1000 pass blocks in that time. Arizona Cardinals: The Cardinals are the only team this season to not play a single rookie on defense. Los Angeles Rams: Out of the 55 wide receivers with 200 or more routes, the Rams have two of the top four in yards per route run. Robert Woods and Brandin Cooks each have 2.63. San Francisco 49ers: Only eight interior defenders have a pressure percentage of 12.5% or better this season, and two of them play for the 49ers in the form of DeForest Buckner and Sheldon Day. Seattle Seahawks: Chris Carson has been tackled for a loss on just 3.8% of his carries, which is the third-best rate for backs this season.